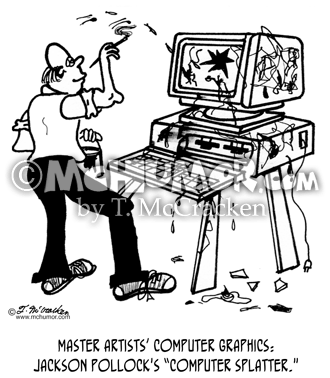 Art Cartoon 2317: Master Artists' Computer Graphics: Jackson Pollock's "Computer Splatter" Pollock splashes paint on a computer. 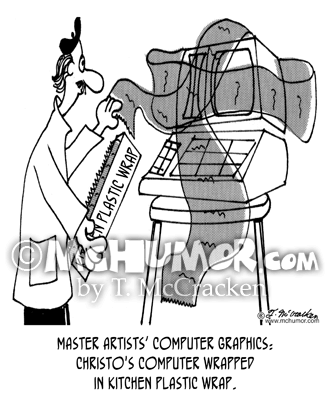 Art Cartoon 4454: Master Artists’ Computer Graphics: Christo's computer wrapped in kitchen plastic wrap. 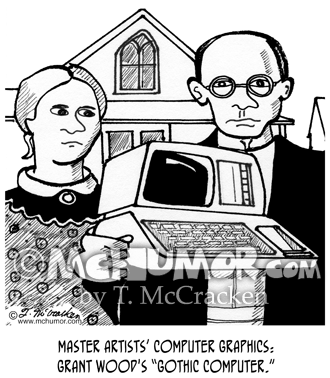 Art Cartoon 2776: Master Artists' Computer Graphics: Grant Wood's "Gothic Computer." 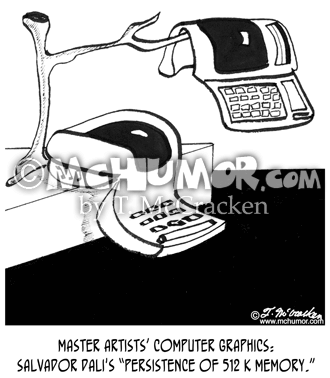 The farmer in Wood's American Gothic holds a computer instead of a pitchfork. 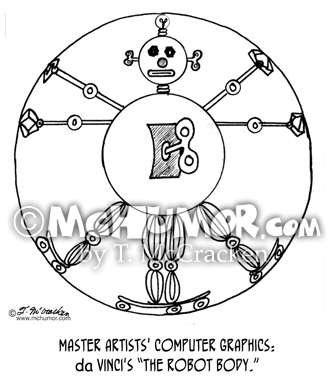 Art Cartoon 2773: Master Artists’ Computer Graphics: Salvador Dali's "Persistence of 512 K Memory." Computers look like they're melting. 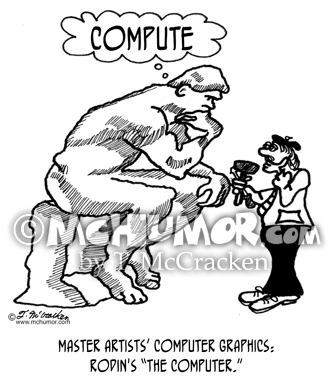 Art Cartoon 2320: Master Artists’ Computer Graphics: Rodin's “The Computer.” The Thinker sculpture thinks, "Compute." 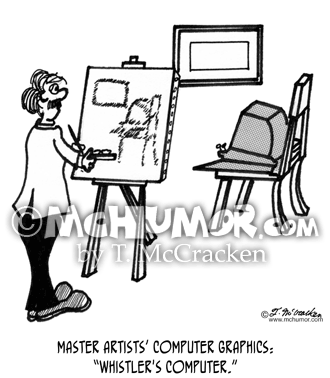 Art Cartoon 2318: Master Artist's Computer Graphics: “Whistler's Computer.” Whistler paints a computer sitting in his mother's chair. 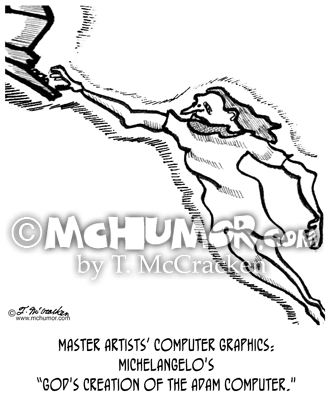 Art Cartoon 2774: Master Artists’ Computer Graphics: Michelangelo's "God's Creation of the Adam Computer." 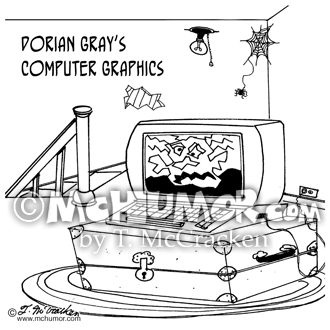 Computer Graphics Cartoon 4825: "Dorian Gray's Computer Graphics." 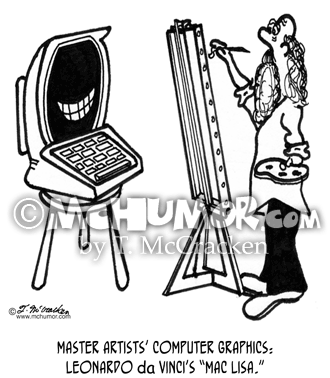 A computer in an attic has a really ugly portrait drawn on it.